FRI Executive Committee member Andy Milkowski explains the three common culprits behind the increased cancer risk from processed meats. In late October, the World Health Organization suggested that each 50-gram serving of processed meat increases the risk of developing colorectal cancer by 18 percent. 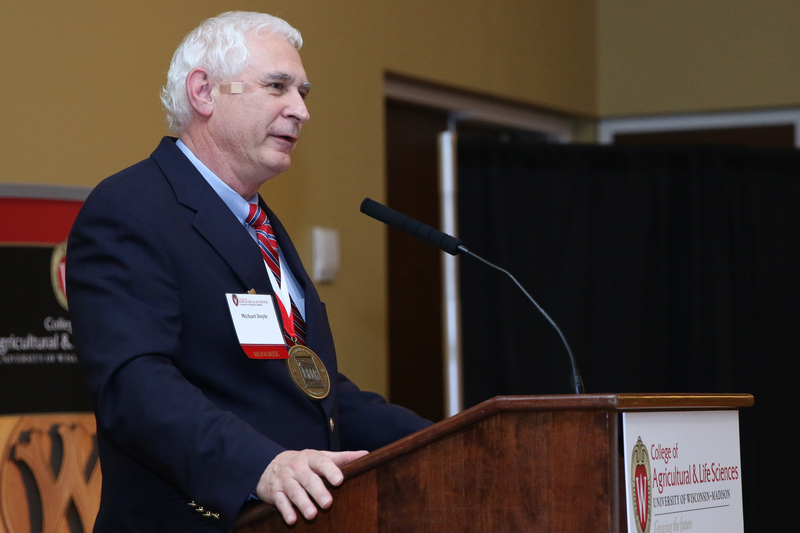 Congratulations to two individuals with FRI connections who last night received the 2015 UW-Madison CALS Distinguished Alumni Award. Michael Doyle, director of the University of Georgia Center for Food Safety, has an international reputation as a food safety expert. Prior to his career at the University of Georgia, Doyle received all three degrees at UW-Madison before joining the faculty, where he was an integral part of FRI for many years. Robert Spitzer also obtained all three of his degrees from UW-Madison. Spitzer serves as the Director and Senior Mentor at FRI sponsor Kikkoman Foods, Inc. In an innovation that holds great promise, FRI Executive Committee member and University of Wisconsin-Madison animal sciences professor Mark Cook and scientist Jordan Sand have developed an antibiotic-free method to protect animals raised for food against common infections. FRI Executive Committee member Andy Milkowski was honored by the Wisconsin Association of Food Protection with the 2015 Leadership Award, which recognizes an individual who demonstrates exemplary performance consistent with the goals of the association. FRI Affiliated Faculty member Federico Rey will present during the Midwest Regional Chapter Society of Toxicology Fall 2015 Webinar Series on the Microbiome in Health and Disease on Nov. 5, 2015. Rey will speak at 12 p.m. CST on "Dissecting diet-microbe interactions and their impact to cardiometabolic health." Click here for more information about the webinar series and to register. Kroger Co. has removed unrefrigerated caramel apples from its shelves due to Listeria concerns after reviewing an FRI study published this week in mBio. In 2014, an outbreak of the bacteria Listeria monocytogenes infected 35 people, killing seven and causing one miscarriage. It was ultimately linked to pre-packaged caramel apples. In a study published Oct. 13 in the journal mBio, FRI researchers conclude that sticks poked into caramel apples release enough juice to create an ideal breeding ground for Listeria. Click here for more news coverage of this study. FRI Affiliated Faculty member Federico Rey will be a featured presenter at a discussion of the Next Generation Researchers Act. The event, with Senator Tammy Baldwin and Representative Mark Pocan, will be held Friday, October 16 from 10:30–11:30 a.m. at the Waisman Center. 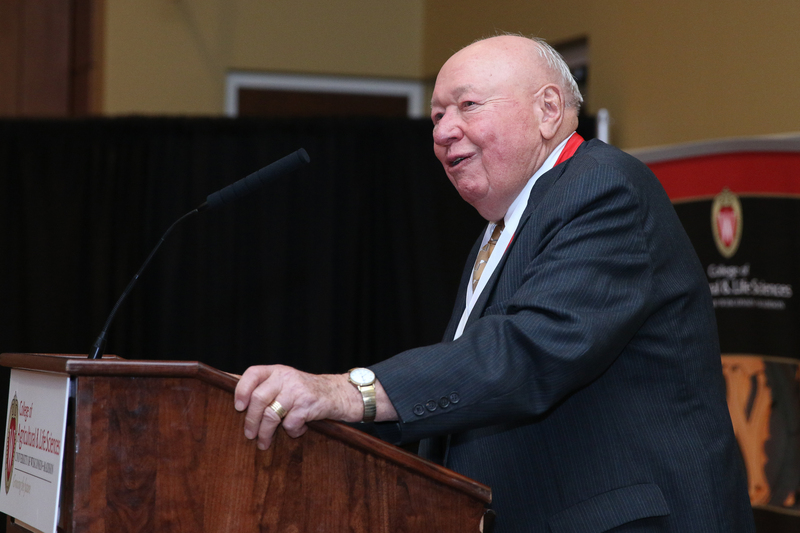 Former FRI faculty member Mike Doyle will receive the 2015 CALS Distinguished Alumni Award at the annual CALS Honorary Recognition Banquet and Ceremony on Thursday, Nov. 12 in Varsity Hall at Union South, 1308 W. Dayton Street, Madison. Led by FRI Executive Committee members Jeff Sindelar, UW associate professor of meat science, and Andrew Milkowski, adjunct professor of meat science, the inaugural USMEF Global Further Processing Seminar highlighted the superior quality of U.S. raw materials, focusing on flavor and palatability of grain-fed U.S. beef and pork. FRI Outreach Program Manager Adam Borger also presented during the event. UW-Madison is building a brand new, state-of-the-art meat sciences facility, set for completion in 2018. A website has been developed so you can learn more about this project and stay connected and current with all project developments. FRI Affiliated Faculty member Federico Rey is set to analyze the gut microbiome of participants in the Wisconsin Longitudinal Study (WLS), one of the most comprehensive studies of aging and health in America. The new effort by WLS and the collaboration with Rey is a rare marriage of biology and social science. The fact that the subjects of the WLS have been intensively tracked for almost 60 years means the information found in their microbiomes can be correlated with where they lived, who they lived with, their health and employment histories, and even their psychological well-being. FRI's Kathy Glass recently led a study to get to the bottom of a listeriosis outbreak linked to caramel apples. She presented her preliminary findings at the 2015 International Association for Food Protection annual meeting in Portland, Ore.
Congratulations to Katie Osterbauer, a student in Kathy Glass's lab, who won first place in the Undergraduate Student Awards Competition at IAFP for her poster on the effect of nitrite on the growth of Clostridium perfringens. FRI Associate Director Kathy Glass discussed sodium reduction and food safety during the “Current Perspectives in Food Safety” roundtable at the International Agency for Food Protection (IAFP) annual meeting in Portland, Ore. Participants of the 2015 FRI Summer Undergraduate Research Program will present their research results in a symposium starting at 9 a.m. on July 21 in Room 6201 Microbial Sciences. We welcome FRI friends and sponsors to attend the symposium in person or via webinar. The schedule of presentations is available here. Contact Adam Borger at acborger@wisc.edu with any questions. For the fifth summer in a row, FRI is providing UW–Madison undergraduate students with the opportunity to explore the field of food safety research through the institute’s annual FRI Summer Undergraduate Research Program. When a team of California researchers reported a new type of botulinum toxin in 2013, they withheld genetic data on the lethal toxin out of concern that malefactors could use the data to make the toxin before an effective antitoxin could be developed. The report stirred considerable interest. It was not only the first report of a novel botulinum toxin in more than 40 years, but it was also a rare example of researchers taking the initiative to limit publication of data out of concern about potential "dual use" of their findings. But last week it came to light that the novel toxin isn't quite the threat it was described. The lab of Eric Johnson, FRI Executive Committee member, and researchers from the CDC found that the novel toxin can be blocked by available antitoxins after all. That suggests that it isn't really a novel toxin. Bibhuti "Don" Ranjan DasGupta died peacefully at home on June 1, 2015. He was born in Kolkata, India, to Profulla Ranjan and Renuka DasGupta on May 3, 1934. He came to UW–Madison in 1970 and spent 26 years at the Food Research Institute as a successful researcher and grant writer. He spent his academic life studying the mechanism and structure of botulinum toxin and was known internationally as an authority on the subject. In 1989, he won the prestigious national Javit Neuroscience Investigator Award. A memorial service will be held on Saturday, June 20, 2015, from noon to 3 p.m. at FITCHBURG COMMUNITY CENTER, 5510 Lacy Road, Fitchburg, WI 53711. Phone (608) 271-6337 or (612) 599-5631. FRI will be among the partners of Wisconsin’s exhibit on the trade show floor at IFT15, the international food industry expo taking place July 11–14, 2015, in Chicago. Wisconsin’s strength in the food and beverage sector will be showcased in an exhibit coordinated by the Wisconsin Economic Development Corporation, along with partners including FaB Wisconsin, Madison Regional Economic Partnership, New Composite Partners, the New North, UW–Madison Meat Sciences & Extension, UW–Madison Center for Dairy Research, UW–Stout Discovery Center, UW–River Falls Food Science, and the Wisconsin Department of Agriculture, Trade and Consumer Protection (DATCP). The exhibit can be found at booth 4956 on the trade show floor. FRI Executive Committee member Mark Cook has developed an antibiotic-free method to protect food animals from common infections. The innovation comes as growing public concern about antibiotic resistance has induced large food companies to announce major cuts in antibiotic use in meat production. FRI Outreach Program Manager Adam Borger is featured in a new video showcasing Wisconsin’s strength in food and beverage production on InWisconsin.com. The video explores the state’s environment of invention, collaboration, and research — efforts that help place the Wisconsin among the nation’s top producers in many food categories. FRI Executive Committee member Mark Cook, professor of animal sciences, has been selected to receive a 2015 UW–Madison Entrepreneurial Achievement Award for turning his research and 20 patented technologies into start-up companies with great success. Congratulations to FRI Executive Committee member Jeff Sindelar, who will be presented with the 2015 American Meat Science Association Distinguished Extension Industry Award at the Reciprocal Meats Conference, set for June 14–17 at the University of Nebraska-Lincoln. The award honors the impact of Sindelar’s outreach work across Wisconsin, the nation and the globe. The World Health Organization (WHO) plans to focus on food safety for this year’s World Health Day on April 7. WHO says the need to strengthen food safety systems across all countries has never been greater, due to an increasingly globalized food supply. The late FRI professor Ed Schantz, PhD, posthumously received the Lifetime Achievement Award in recognition of his preparation and setting of standards for Botox® in the late 1970s through 1980s at the International Neurotoxin Association (INA) Meeting, held Jan. 13–15 in Portugal. Schantz made the first batches of Botox® at FRI, and later he and FRI Executive Committee member Eric Johnson, PhD made batches of Botox® at FRI used in commerce. Schantz shared the award with Alan B. Scott, who pioneered the clinical development of Botox®, at the Smith-Kettlewell Eye Research Institute in San Francisco. FRI Affiliated Faculty Stacey Schultz-Cherry has been elected as a Fellow of the American Academy of Microbiology. Fellows of the Academy are elected annually through a highly selective, peer-review process based on their scientific achievement and original contributions that have advanced microbiology. FRI Science Writer Wendy Bedale summarized the FRI/IFSH Rapid Methods in Food Safety Microbiology Symposium for the March/April 2015 issue of Food Protection Trends. FRI Executive Committee member Jeff Sindelar discusses how to prevent defects in whole-muscle meat products in this Meatingplace article.